How to turn tagging and artwork anarchy into Blissful order | What Hi-Fi? It's hard to argue with the benefits of having an entire music library at your fingertips. Finding a favourite work, or album, or track, is no longer a matter of hunting through racks and stacks of CDs, but can be achieved with a few taps of a finger on a smartphone or tablet screen, after which the music simply plays through the system. Trouble is, as your music library grows, so does the potential for problems: albums either ripped or downloaded can seem invisible to your network music players, tracks can default to playing in alphabetical order rather than by number, compilation albums can appear as a whole series of micro-albums divided up by artist, and album artwork can be wrong, or simply non-existent. I've lost track of the evenings and weekend afternoons I've lost ploughing through folders of files, using applications such as Tag and Songbird to type in endless details, only to have them all vanish due to some setting I've overlooked. And when quite a lot of your listening is to early releases of classical sets, many of which have long track titles, upwards of 30 tracks per disc and of course no hint of recognition from any of the familiar databases, things can be doubly tricky. Usually either XLD or even iTunes will come up with something with some coaxing, but sometimes – and it's usually with the multidisc opera sets! – there's no alternative to typing in track names and details. What's more, not all (legally) downloaded music is equal when it comes to artwork and tagging: some sites tag well, others have their own ideas on how it should be done, including catalogue numbers in track titles, or tagging composers as artists, or even not including any information at all. To say the least, it's a tad frustrating. All of which explains how I currently have a music storage system comprising some 1250 folders, most with several subfolders, and getting on for 50,000 tracks – or 'songs', as iTunes would have it – and some severe need for solid time spent sorting out tagging inconsistencies, finding artwork and the like. After all, while you can live without an album sleeve picture staring at you while the music is playing, it's good to have if possible: it just makes things a little neater. 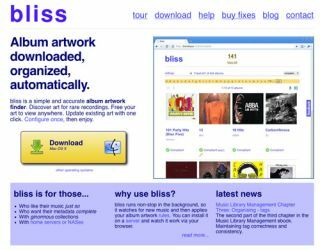 So it was with interest that I stumbled across Bliss, a software package claiming to solve all those artwork and metadata tagging problems. Actually, my first introduction was via the free downloadable e-book published by Bliss developer Dan Gravell, which gives a brief and sensible overview of all things tag-related. You can download a PDF copy here, or choose ePub or Kindle versions. Having read and digested that – and if you're prepared to put in the work yourself, that may be all you need – , I downloaded the free trial version of Bliss, which comes in a variety of platform-specific versions: for Windows XP/Vista/7, Mac OS X, Linux and Vortexbox. The way this works is you get a free download, limited to 100 fixes – corrections to the database, such as the addition of cover art –, and then you can buy additional fixes as and when you need them. 1000 fixes will cost you £10; unlimited fixes can be had for £30. In use, Bliss can be loaded onto the device where your music is hosted, where it will work in the background, being accessed remotely via a web interface. Various third-party solutions have been developed to install it on some popular servers – this one, for example, makes it available to Synology users, and this is for ReadyNAS devices – but as yet there isn't a direct QPKG version for the QNAP server I'm using, so I had to resort to using the software on my MacBook, and 'pointing it' at the NAS drive. This is a simple matter of browsing for the music store, and then off you go. And how does it work? Exceptionally well: true, it took a day or so to chug through the stack of music I have on the NAS, and until I got into the swing of the set-up it was throwing up all sorts of error messages, but once I got the hang of the settings – which is basically just to set it to update everything automatically! – it cleaned up my extensive music library in pretty short order. But there's plenty of flexibility in there if you want to tinker: as seen above, you can specify sizes for album art, for example, decide whether or not to embed art in the music files themselves, and adjust the format in which music files are labelled, stored and tagged (below). It certainly makes using the library even more convenient, making this software well worth exploring for anyone with a growing amount of music on a server. Apart from anything else, it makes your collection look better, saves a lot of manual retagging, and might even free up some of those evenings and afternoons for listening to the music, rather than fretting over it.